If you need help with your WordPress site now, but don’t need a full service, I’m offering to do simple WordPress services for $50 per hour. This is pre-paid only! This is non-negotiable as my hourly rate is normally $75. 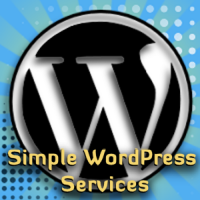 Below are just some examples of simple WordPress Services. So, if you need several jobs done, you will need to list all your jobs that you need done so I can give you a correct estimate of time. In the case that your issue cannot be resolved, you will receive a refund. It is very rare that such a thing would occur. This is not a service to design website headers. I only accept PayPal for payment. The time it takes for your project to get done actually depends on your promptness to pay your invoice as they can be finished in the same day or next day. Please be prepared to either have a WordPress login created that has administrator level access. For security purposes, please don’t send your own username and password.In some cases, you may need to provide a FTP login as well. Note: Your information will never be shared by anyone. Step 1. Fill out the form. Please list what you need done. If you need more than 1 job done, you will need to write them down and label them with a number. Thanks! If you were referred here by someone, please list their name and email. Within 1 to 24 hours you will receive an email confirming your order (from me personally) and verifying information before I begin. I will ask for your login information and FTP information. I will also send an invoice via PayPal. Pay for your service, or services needed. I will start on your project as soon as payment and information is received. Your job will be completed within the same day or up to 48 hours after payment is received.